Pan dulce (English: sweet bread) is the name for a variety of Mexican pastries. The creation of sweet bread was influenced by the French and Spaniards who were the ones that introduced baked goods such as crispy rolls, baguettes, and sweet pastries to Mexico. This inspired the indigenous peoples to create different types of panes dulces such as besos, conchas, and cuernos, among others. Pan Dulce is considered to be one of Mexico’s most inexpensive treats and is consumed daily as breakfast or late supper, known as merienda. Pan dulce is considered to be a Mexican cuisine even though its origins are European in that the term and the bread originated in from Gibraltar. Other countries in Latin America and even Europe have adapted some of Mexico’s pastries, but it is in Mexico that the creative new shapes originate. Today, pan dulce is seen in many parts of the United States, especially in places like California and Texas, as a result of migration. In Mexico, pan dulce is typically consumed at breakfast or evening supper. It is usually accompanied by hot chocolate, milk (or warn milk), or coffee, and is dipped into the drink for better taste. It can also be eaten alone. Pan dulce has been an important part of Mexican cuisine since the colonial years when the Spaniards introduced wheat and the French brought crispy baguettes and rich pastries. Traditional local dishes were soon replaced with European cuisine that aroused Mexican’s taste buds. 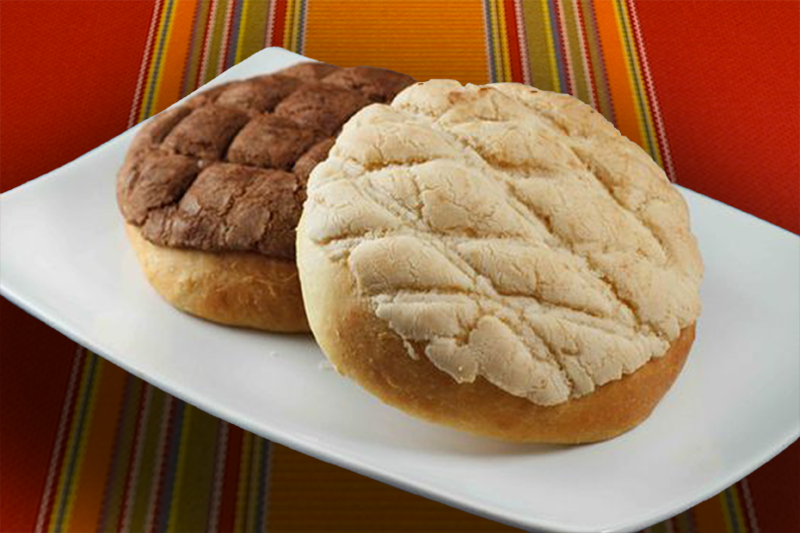 In addition to its great taste, pan dulce is also inexpensive, an incentive for daily consumption. Besos – A beso (kiss), from Mexico, is made by creating round domes on the top with a drop filling of jam in the middle. Campechanas – Campechanas are rectangular glazed Mexican pastries, a very common pan dulce. Conchas (shells) are known for their shell-like shape and sugar shell pattern on the top. This is one of the most famous Mexican pastries and widely recognized in the United States. It is also referred to as “pan de huevo” (egg bread) in other Latin American countries, such as Chile, where you eat them for tea time or on the beach. Empanadas (turnovers) are a pastry more commonly served in Cuba and South America but also have a place in Mexican cuisine. They are filled with meat or other ingredients such as cheese or vegetables of different sorts. They are also filled with fruit such as pumpkin or apple. Marranitos / cochinitos / puerquitos (little pigs) are pig-shaped pastries sweetened with piloncillo and spiced with cinnamon. The bread has erroneously been called “gingerbread pig” because the finished result looks similar to gingerbread. However, ginger isn’t used to make the pastry. Orejas (ears) are flaky and sweet Mexican pastries that are shaped like an ear and are very common at bakeries. They are very similar to a French Palmier. Polvorones (wedding cookies) are shortbread cookies, often eaten at weddings. Rosca de reyes (‘kings’ crown’) is a treat in addition to a gift that is given on Three Kings Day, Dia de los Reyes Magos, which is held twelve days after Christmas, the celebration date of the birth of Jesus Christ. This bread is symbolic in many ways, the most illustrative being its round shape which signifies the crown of the Reyes Magos; see Biblical Magi. Baked inside is a small white plastic or ceramic figurine which represents the baby Jesus. The hidden baby Jesus symbolizes the secrecy of the location of Jesus as a child. The ruler of Jerusalem, King Herod, upon learning about the birth of the rightful King of Jerusalem, ordered that all male infants be killed so that he could keep his crown. Whoever finds the small figurine is obligated to host a party for the celebration of the Dia de la Candelaria – Fiesta de la Candelaria – which occurs on February 2. Pan de muerto (‘bread of the dead’) is a special bread that is consumed and offered as a part of the Día de Muertos celebration in October and November. Day of the Dead is a lively and communal commemoration of the dead. Pan de muerto dates back to the conquest years as a replacement for the Aztec rituals of human sacrifice. As the Spaniards witnessed a heart being ripped out of a human and then bitten, they created bread in shapes of hearts with red coated sugar to avoid human sacrifices. Pan de muerto traces its roots back to the Aztec tradition of placing food as offerings on the tombs of the deceased. The food offerings sustained the spirits on their journey to their underworld. The bread takes many different shapes, from skulls to animals to crosses and mummies. The traditional pan de muerto is shaped like a skull, round, with a little ball at the center top to represent a cranium. Following are the four bones to symbolize the four courses of the universe.